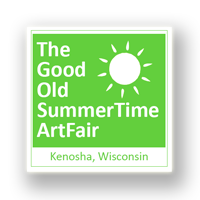 The Kenosha Art Association proudly announces the 39th Annual Good Old Summertime Art Fair. In addition to the same great artistic talent that has been on display for so many years, new activities and demonstrations have been added for your entertainment and enjoyment. Live music, new food vendors, children’s activities, art demonstrations, Face Painting, and Caricature Portraits. In addition, Kenosha Unified School District, the University of Wisconsin – will all be promoting art activities and students’ work. It’s all taking place on Sunday, June 1, 2014, from 10 a.m. to 4 p.m. in Civic Center Park, located on Sheridan Road between 56th and 57th Streets. Bring the kids and the grandparents! You will find exhibitors of fine arts and crafts, great food, and a whole lot of good old summertime fun. You won’t want to miss it! See you there! This entry was posted on May 16, 2014 at 5:34 pm and is filed under EVENTS. You can follow any responses to this entry through the RSS 2.0 feed.